Two new albums, recorded on opposite sides of the world – in Birmingham and Melbourne – but both featuring the incredible talents of period horn player Anneke Scott. The two albums look at the repertoire of horn virtuosi of the 18th and 19th centuries, Stolen Beauties of Joseph Leitgeb, Giovanni Punto and Giovanni Puzzi and Songs of Love, War and Melancholy of Jacques-François Gallay, presented on instruments of their times. Both programmes are dominated by transcriptions and paraphrases – hence the Stolen Beauties title – obliging the solo horn to take on a range of musical personas, more often than not imitating the human voice. Both programmes have been designed with variety and interest in mind – you’ll learn much from them about horn virtuosi of the Classical and Romantic eras, but without it ever feeling like a history lesson. 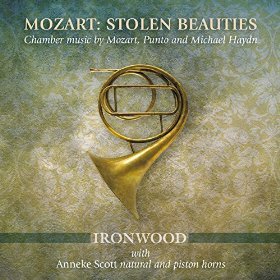 Stolen Beauties hovers around the music of Mozart, but is more concerned with its reception and reinvention in the early 19th century. Two major Mozart works are included, a concertante, arranged by Barham Livius from the “Kegelstatt” Trio, and the E flat Major Horn Quintet. These are joined by an anonymous fantasy on “Là ci darem la mano” from Don Giovanni, an arrangement by Michael Haydn of the slow movement of Mozart’s Third Horn Concerto for horn quintet, and three duos for horn and cello by Punto himself. Ironwood, the accompanying ensemble, is an Australian period instrument group here made up of violins, violas, cello and fortepiano. Some of the arrangements are quite large, especially the Don Giovanni fantasia that opens the programme, but good balance is always maintained, with the horn never struggling for dominance. The string players avoid vibrato but still achieve a broad, round tone with plenty of expression. Predictably, perhaps, Giovanni Punto doesn’t come out too well in comparison to Mozart. Mozart’s melodic genius carries this album, and is all too obviously missing in the short Punto interpolations. But then, Punto has the upper hand when it comes to writing for the horn, and the instrument is beautifully displayed in each of his short movements. Anneke Scott is credited as playing natural and piston horns, but in fact she plays the same instrument throughout. It has a sauterelle, a detachable valve section taking the place of the instrument’s crook – usually, as in this case, a later addition to an earlier instrument. As is clear from the playing on both of these albums, Anneke needs no help from such technology to achieve the many technical feats the music requires. But from her research, the detachable valve section was probably associated with some of this music, so she uses it for the different colour palate it offers. 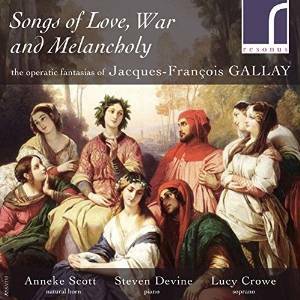 Songs of Love, War and Melancholy brings us forward a generation, at least in terms of the music being transcribed, with concert paraphrases by Gallay of early Romantic Italian operas by Donizetti and Bellini. Anneke Scott is accompanied by Steven Devine at the piano, an Èrard from 1851 – it’s 60 years younger than the fortepiano Neal Peres Da Costa plays on the other recording but sounds very similar, a bit more resonant perhaps, and a bit more boxy with it. Several of the numbers also include soprano Lucy Crowe, on emotive and impressively operatic form, although Gallay is always careful to maintain a dominant position for the horn, so these tend to be duets among equals. The best-known music here, at least to me, is Bellini’s La Sonambula. That transcription has some satisfyingly low music – it is so rare to hear the lower register of the horn in early showpieces like these, but Anneke’s sound down there is rich and characterful. Elsewhere, there are plenty of pyrotechnics: fast runs, big leaps, searing melodies. No detachable valve section this time, it’s all done on the face and with hand stopping, and is all the more impressive for it. The two albums are released on ABC (Stolen Beauties) and Resonus. The last time I came across the latter, they were a download only label, so it is good to see that they have branched into physical media. For more tech-savvy listeners, though, downloading might still be preferable, as all their recordings seem to be available in higher-than-CD resolution. The recording quality on both discs is good, though I might give the palm to the Australian team, if only because the piano and the voice sound a little recessed in the Gallay. One final bonus: Both discs come with comprehensive notes by Anneke herself, detailing the research she has put into these programmes, the instruments played and the performance practice issues behind each. The Gallay notes are particularly impressive, running to nine pages and including a detailed biography of Gallay and discussion of the times in which he worked (the full notes for this CD can be accessed free at http://www.resonusclassics.com/freedownload/RES10153_booklet_300dpi.pdf). The Mozart notes seem to have been written for more general audience (with terms like “natural horn” explained) but are just as informative and readable.